William Crisp Malts; Columbus, Fuggles, and Northern Brewer Hops. 12.8º P - 51.6 IBU’s. Bier Cabinet Spring Cleaning Continues. I bought a six pack of this when friends were over back in early march. I thought is was pretty good at the time and kept one in the fridge to review. So lets see how the Erie PA APA holds up to full review. 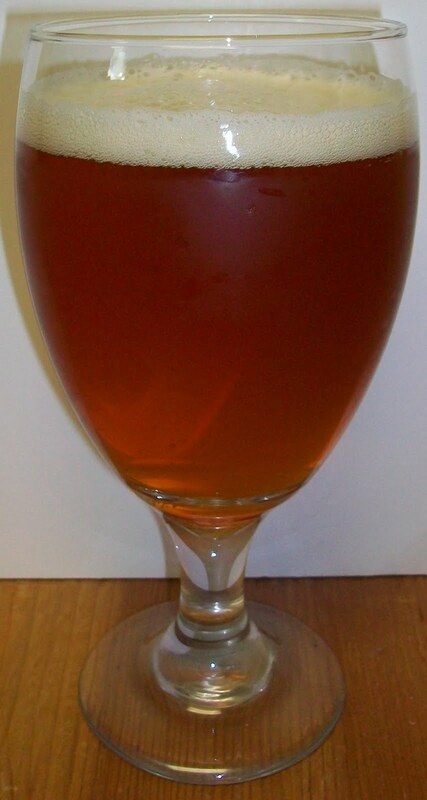 The beer pours a pale amber with golden/orange hues with a white head. This beer has a very pleasant nose; a nice caramel malt sweetness with citrus hop notes. This really smells great for an APA very inviting without an overpowering hop presence. I can’t wait to see if it’s as refreshing as its nose invites. Sweet caramel malts on up front on the tip of the tongue but that only last for a split second followed by a nice effervescence over the tongue. This mid-sip effervescence is also laden with a building hop experience. By the time you get to the top of the swallow you expect this to build to an overpowering bitterness but it doesn’t. It seems to mellow during the swallow. There is different hop experience on the back-end of the swallow that leads to a dryer hop finish, once again not too overwhelmingly bitter. The finish is also a rich hop experience; still fairly dry and not overly bitter. The final aftertaste is hoppy but still seems to be somewhat refreshing. There are at least 3 possibly 4 different hop flavors in the tasting experience. The nose, mid-sip, back-end and finish all seem to have a distinct hop flavor or note different from each other. As much as I’ve been taking about hops I want to be clear that this beer is hoppy but not overly bitter. But this bitterness does seem to be a little much for the style. Well, at least a little much for my preference. The head has diminished to just a patchy island with a ring around the glass. It is however leaving some lacing. The beer has warmed to 63 degrees. It is not as easy drinking as it onece was. The finish is also picking up some unpleasantness. 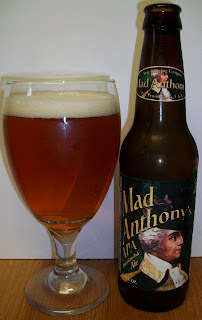 I seemed to convince myself during this review that the hops were not overpowering. But actually I think they are. Not that they are overly bitter but at no point in this review did I mention the malt aspect of this beer. I just realize that is because it’s not there. So, even if this is not overly bitter the hops do dominate the entire experience. Only on the nose and in the upfront tip of the tongue taste were the malts really noticeable in this brew. This is not a very easy drinking or refreshing APA; especially now that it has warmed a little. There is just a little too much hop bitterness during the swallow for it to go down smooth. And the finish is not as refreshing as it could be. All and all this is not a bad beer. The hop profile in this beer is more than what I have seen in some American IPA’s. I suspect that that is too much for this style but hops are my weak link when it comes to tasting and reviewing beer. I even bought a hop appreciation kit to lean more about the different hop styles. I really need to do more homework on the subject. So based on other American Pale Ales that I have had and liked, I’d have to give this one a C. It is a very drinkable beer but it’s not up there with some of the other APA’s. Dales Pale Ale, A+, My gold standard for this style.